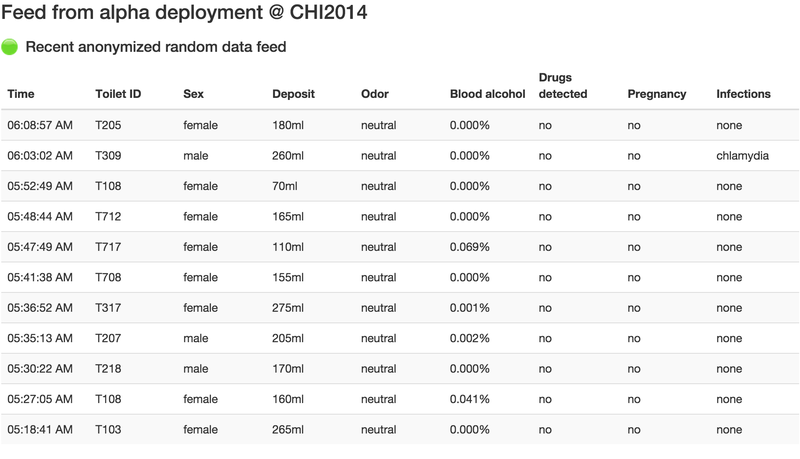 The Quantified Toilets was a thought experiment carried out at CHI 2014 Conference in Toronto. It consisted of the creation of a fake company that was able to collect and analyse the biological waste of buildings, interpreting this data in real time and alerting facilities’ users about possible hazards through its website. The company’s activities were communicated through stickers placed on strategic locations in the washrooms of the conference venue, which directed users to its website where “live” feed data could be accessed. The aim was to engender reflection and discussion regarding issues of surveillance, data, and privacy. This project was developed as part of the Critical Making Hackathon together with Matt Dalton (SFU), Angela Gabereau (FabuleFab), Sarah Gallacher (UCL), Lisa Koeman (UCL), David H. Nguyen (Nokia).